The science of the existing biogas upgrading technologies is very young and rapidly evolving. In this article we provide our rapid introduction to this subject. But, before you scroll down and read our article, you might like to watch our video which is an introduction to the content of this page, if you have not seen it already. The primary function of biogas upgrading involves removing CO2 to improve gas quality by increasing the volumetric energy content. Biogas upgrading is necessary for natural gas pipeline injection and vehicle fuel applications. In this text we concentrate on CO2 removal as the most important part of any biogas upgrading undertaken. The most widely commercialised and used upgrading technologies are those that have for a long time been employed by the natural gas industry, pressure swing adsorption (PSA), chemical solvent scrubbing (using amines), and pressurised water scrubbing. Newer technologies have recently broken into the market by improving efficiencies, lowering costs, or decreasing the footprint include physical solvent scrubbing (using glycols), membrane separation, and cryogenic distillation. There are also a number of emerging gas upgrading technologies in the research and pilot phase that claim lower operating costs as well as simpler and more compact process designs which are in our list and we have described later (e.g., rotary water scrubbing, supersonic separation, industrial lung). Although the main purpose of biogas upgrading technologies is to remove CO2 from the gas stream, other contaminants may also be removed. However, specific contaminant pre-treatment (especially for hydrogen sulfide) is usually needed to improve the absorbent’s lifetime, lower regeneration costs, and reduce maintenance intervals. Pressure swing adsorption (PSA) is a method for the separation of carbon dioxide from methane by adsorption/desorption of carbon dioxide on zeolites or activated carbon at alternating pressure levels. This technology is often applied in the gas treatment industry as it also effectively removes volatile organic compounds, nitrogen and oxygen from industrial gas streams. CO2 can also be removed from a gas stream by chemically binding it to certain dissolved compounds or liquid chemicals, for example, alkaline salt solutions and amine solutions. There are two types of chemical solvent scrubbing and these are known as Alkaline Salt Solution Absorption, and Amine Absorption. In this popular method compounds can be physically absorbed (or dissolved) into a liquid solution. Water is commonly used as he solvent due to low cost, low toxicity, and high availability. CO2 and H2S preferentially dissolve into water compared to CH4. Like pressure swing adsorption, pressurised water scrubbing is a popular process for gas treatment because of its ability to simultaneously remove many other contaminants: ammonia, sulphur dioxide, chlorine, hydrogen chloride, hydrogen fluoride, aldehydes, organic acids, alcohol, silicon tetrachloride, silicon tetrafluoride, and siloxanes. Carbon dioxide and hydrogen sulphide can also be absorbed using liquid solvents other than water. The most industrially applied of these are organic glycols (e.g. polyethylene glycol). In return for higher cost and complexity than water scrubbing, these physical organic solvents allow for greater H2S and CO2 solubility than in water, allowing for lower solvent demand and reduced pumping. Glycols for scrubbing biogas can be commercially found with such names as Genosorb® 1753, SELEXOL, Purisol, Rectisol, Ifpexol, and Sepasolv. Membrane separation utilizes high gas pressures to create a large pressure differential across a nano-porous material (membrane) causing gas separation by several different mechanisms. These include molecular sieving (size exclusion), Knudsen diffusion (mean path difference), solution-diffusion (solubility difference), surface diffusion (polarity difference), and capillary condensation (adsorption). Biogas generally requires pre-treatment to remove aggressive substances that can destroy the membrane material, at the current stage of development of these biogas upgrading technologies. Cryogenic distillation takes advantage of the fact that carbon dioxide will condense and freeze before methane condenses allowing the CO2 to be removed from the gas stream as a liquid or solid. In cryogenic distillation, biogas is compressed anywhere between 260 – 435 psi (18 – 30 bar) and cooled by heat exchangers down to -45 to -59 °C until certain gases become liquefied. High system pressures are used to ensure that carbon dioxide remains in the liquid phase and does not freeze, which would clog the pipe and heat exchanger system. The liquefied carbon dioxide is then easily separated from the remaining gas, producing highly pure biomethane. The Cryogenic Distillation process is only cost-effective at large scales, given the current stage of development of biogas upgrading technologies. 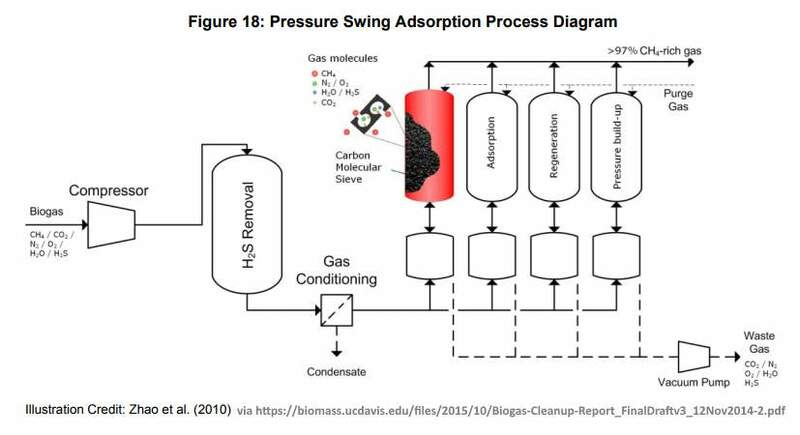 A recent, novel approach to gas clean-up is supersonic separation, consisting of a compact tubular device that effectively combines expansion, cyclonic gas/liquid separation, and re-compression. A Laval nozzle is used to expand the saturated feed gas to supersonic velocity, which results in a low temperature and pressure (Figure 29). This causes the formation water and hydrocarbon condensation droplet mist. A high vorticity swirl centrifuges the droplets to the wall, and the liquids are split from the gas using a cyclonic separator. This gas conditioning technology has been used to simultaneously condense and separate water and hydrocarbons from natural gas. Further developments allowing for the bulk removal of CO2 and H2S are currently underway. An industrial lung, also known as an ecological lung, is a bioengineered process which utilizes carbonic anhydrase—the enzyme present in our blood that catalyzes the dissolution of carbon dioxide formed from cell metabolism. Carbonic anhydrase pulls CO2 into the aqueous phase in an absorber column where it can be picked up by an absorbent (Figure 30). The CO2-rich absorbent is then regenerated by heat in a stripper column releasing a pure stream of > 90% CO2. Laboratory experiments with biogas showed that they can purify it to 95 – 99% methane content with a CO2 content less than 1%. CO2 Solutions is currently operating a large bench-scale unit. The cost of full biogas upgrading to enable its use in commercial vehicle fleets and for injection into the natural gas grid for distribution to private and industrial natural gas customers has two classifications. These are cleaning and purification. The biogas must be both cleaned by the removal of unwanted constituents, such as water and CO2, and further purified to reduce low level contaminants to become very close to the composition of natural gas. Biogas cleaning, whether by adsorption, water scrubbing, or biofiltration, requires the purchase of a reactor vessel. Water and bio scrubbers require large sized reactors and liquid pumps whereas dry absorption chambers do not. However, adsorption systems require the eventual change-out or regeneration of media. Thus, adsorption systems will have lower upfront and operating costs, but can have higher maintenance costs. Hydrogen sulfide is usually the largest contaminant in biogas after CO2, and thus a primary target for cleaning. Consequently, the cost of biogas cleaning is often listed in terms of dollars per amount of sulfur or hydrogen sulfide removed. For gas streams with 500 – 2,500 ppm H2S, it generally costs $1.50 – $5.00 per pound of sulfur removed (McDonald and Mezei 2007). To remove moisture, a refrigeration or gas condensation system is often applied. Biogas cleaning is generally the lowest cost of the two requirements. Biogas upgrading technologies, on the other hand, are more complex and more costly. New and emerging technologies that consolidate biogas cleaning and upgrading, such as cryogenic distillation and supersonic separation, will generally be more expensive than already established technologies. Membrane separation may be an exception, providing cost savings as long as membrane replacement rates remain low. However, among the three most common upgrading technologies—pressure swing adsorption, pressurized water scrubbing, and amine absorption—there is no clear winner in terms of initial cost. Upgrading technologies are also affected by economies of scale. The cost of treating biogas drops sharply with higher raw biogas throughputs. Biogas Upgrading to Biomethane for grid injection or transport vehicle use requires more sophisticated cleaning than is necessary for electricity generation, and on top of that the upgrading equipment has to be paid for. Much of the upgrading equipment capital spending cost is offest by biomethane production not requiring a biogas engine, but upgrading equipment using traditional methods costs more to run than a generator. Connection to the gas grid is usually more expensive than connecting to the local grid power lines, and upgraded biogas must also comply with stringent and expensive continuous testing requirements if it is to be accepted for grid injection. This entails laboratory costs, and commonly also a high level of management time liaising with the Gas Grid Company to demonstrate the continual quality of the injected biomethane. 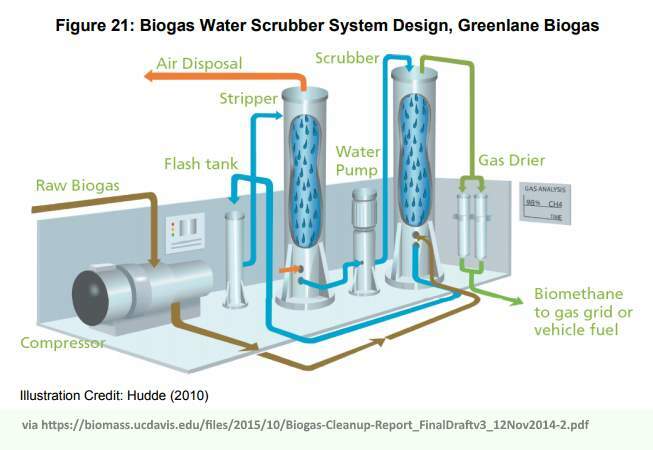 Technology Options for Biogas Clean‐up here. But what about water (or chemical) costs being included in the economics, and why are they seemingly ignored so frequently in online studies & reports, when water is not cheap? Brian: apologies for the delay in replying. I totally agree that all consumables must be included in pricing comparisons, or the economic basis is lost. I think that in solvent scrubbing applications, for example, it should be possible to re-use the solvent (chemical or water). I would advise though that careful questioning of glib assumptions of 100% re-use, should be probed carefully, as even a small loss of solvent after recovery, may impose a significant cost. These are some of the things a salesman may not reveal unless a client has a detailed knowledge of processes, and the forethought to ask such questions. So, let’s have the comparitive economic & environmental analysis data, please?? Brian: Biogas systems vary. There is simply no one comparative review of these technologies which can be made. Each one will be specific to the project. All I can suggest is that you go to the link in “Attribution” above, and read the case studies in Appendix B, and the cost information which is included. There may be a case study similar to your own project in there, which might give an indication of cost. Thanks for a prompt response. What I was meaning was for you (or other) to take an example (or case study) for which data is available and provide a comparison of all possible methods for upgrading that data and tabulate? I don’t think we can afford the sorts of prices for hydrogen sulfide removal which are given here. We are thinking of going down the additives route on this. Who is the best to go to and trustworthy on additives? Karry: Although I am much complimented by your faith in my knowledge and ability to provide recommendations, the truth is that you, and others on this post, are asking more than can be provided in a public forum like this. Bright Biomethane offers well-proven systems to upgrade biogas to biomethane in standard capacities from 40 Nm3 biogas / hr to 5,000 Nm3 biogas / hr (and higher). Bright Biomethane is one of the few suppliers thatcan deliver a complete range from small to large biogas upgrading installations. Combine that with the fact that CO2, removed from the biogas, can be recovered and liquefied to create an extra source of revenue for the plant owner, and the prospect is good. What i do not understood is actually how you are not really a lot more well known. You are seeming to be the source for many who need to know about biogas upgrading. You seem to get a lot of people willing to comment on your pages. You should be recognized therefore considerably more on the subject of this matter. Your own stuff is excellent. Catch onto my url link, for more info. Which method is cost effective? Ankit – As in so many things it is a case of “horses for courses”. Biogas plants vary so much in size and location, and in impurity. There will be no clear winner. On top of that there are questions of whether a technology supplier offers a service within a country and such matters as availability of spares and of any chemicals needed. Membrane technology does appear to be very popular, but that is not necessarily a correct view. if any reader can suggest there is a winning technology for all uses it would be great to read your comments, but otherwise contact the suppliers of these upgrading technologies and ask for quoted prices. That’s the only sure way to find out the answer for a particular site. It does require potentially a fair amount of work on the behalf of the purchaser, but the investment warrants careful selection for a reliable, low cost upgrading solution.. Eminent blog, I am moving forward in my upgrading. Which when complete may be very rewarding, however I need to further expand. Which is best tech which you recommend. Tell us soon. Would this system be thought about as being a Continuous stirred-tank (CSTR) reactor? or exists another name for this kind of reactor?